CityGrows encourages all our partner governments to move away from relying on printed paper forms as evidence that a permit or license process has been completed. With CityGrows, any staff member or enforcement officer with access to the internet can always check whether a permit process has been completed and a valid permit has been issued. There's no reason to worry about approval stamps or signatures when anyone can check on a permit at any time! Nevertheless we know that applicants may wish to print a copy of their completed application or permit for their records or to submit to a bank or other external institution, and some departments still prefer printed permits to be available on-site for inspection (for example, for a Special Event Permit, Building Permit, or Oversize Load Transport Permit). 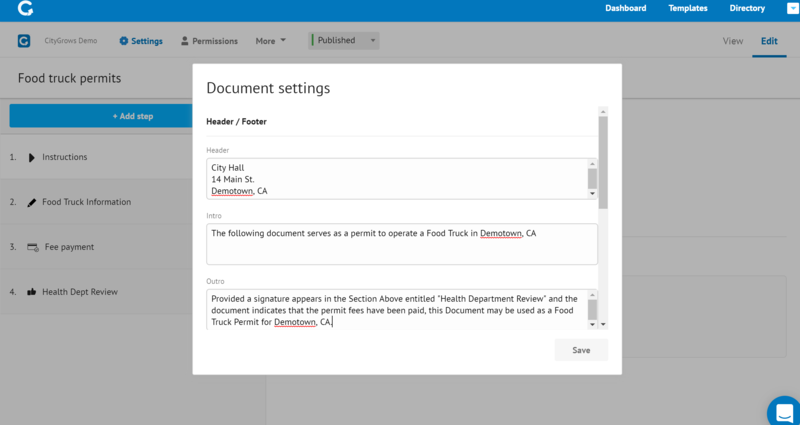 While CityGrows doesn't yet offer our clients the ability to completely customize our PDF exports (a new feature that's coming soon!) we do offer some simple customization options that are working well for our existing clients. To set up these options, please go to the "Document Settings" section under the "More" tab. There are 2 main types of customization. Text: You can add text to augment the questions and answers and information that's already been captured as part of the process. Intro text: A good place to add more description about the process or remind the applicant of requirements they must adhere to. Outro Text: Several governments use this to clarify which elements must be visible in the document for it to be a completed permit (e.g. This permit is valid if a signature appears under "Health Department Inspection" and the above indicates a permit fee was paid). Also good place to put legal disclaimers. Footer: Another good place to put legal disclaimers or information about expiration, etc. or additional contact info or website address. Sections: Scroll to the end of the Document Settings to select which sections of the template should appear on each printout. You can determine whether or not to include information from Collect Information, Payment, and Review steps. 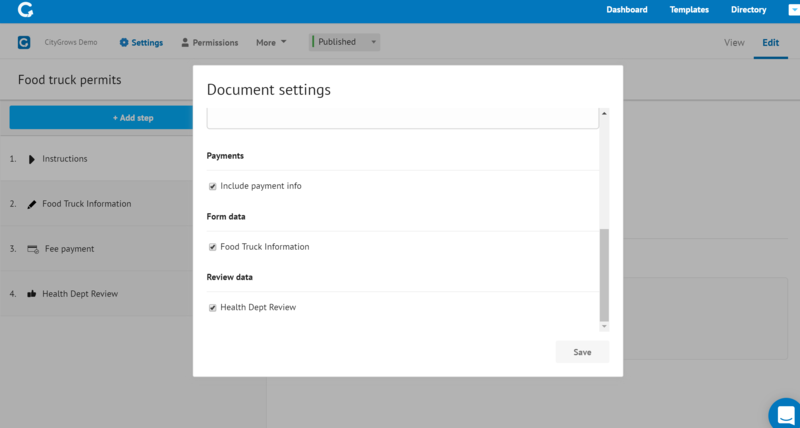 Don't forget to hit "Save" at bottom right to preserve your new Document settings! 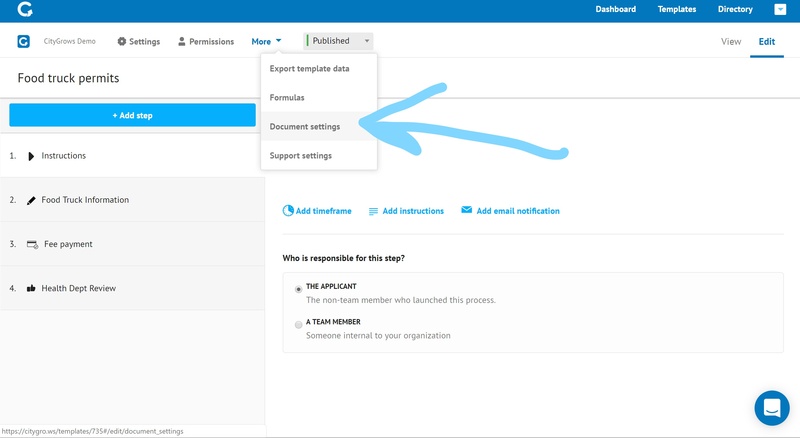 And remember, when you are looking at an individual process, you can access/ download/ print a PDF any time by clicking on "Menu" at the upper right of the screen.